With great sorrow the family of Kazuo Nakamura announce his passing in Lethbridge, Alberta on the 5th day of January, 2019 at the age of 89 years. He was the beloved husband of Nancy. He is also survived by his two loving daughters, Eriko (Katsutoshi) Yamada of Japan and Lisa (Doug Mathieson) Nakamura of Vancouver; and a step son, Timothy (Catherine) Katakami of Red Deer; by two grandchildren, Quintin Nakamura and Ciara Yamada; two step-grandchildren, Steven (Janie) and Kristin; and by sister, Keiko Nakashima and niece, Mari Nakashima, both in Japan. Kazuo was born on June 30, 1929 in Fukuoka, Japan to Nobuo and Satoko Nakamura. He received his early education in Japan and obtained his PhD (in Genetics) at the University of Missouri in 1964 and D.Sc (in Biology) at the Kyushu University in 1967 and a post-doctorate at UCLA from 1965 to 1969. 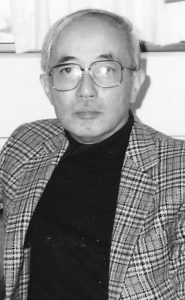 He taught at the Fukuoka University from 1968-69 and moved to Lethbridge in 1969, where he taught at the University of Lethbridge until his retirement in 1994. Kazuo was an active member of multiple national and international biological associations with research and publications in the areas of fungal genetics and phycological genetics. He was also actively involved in the exchange program of the University of Lethbridge with Hokkai Gakuen University of Japan since its onset in 1982 until the time of his passing. He will be greatly missed by family, friends and Colleagues. A Service will be held on Tuesday January 15, 2019 at 11:00 A.M. at the BUDDHIST TEMPLE OF SOUTHERN ALBERTA, 470 – 40 St. S. Lethbridge, Alberta. In lieu of flowers, family and friends may make a donation to the Kazuo Nakamura memorial Biological Scholarship, c/o University Advancement Office, University of Lethbridge, 4401 University Drive, Lethbridge, AB T1K 3M4. I am very sorry to learn of the passing of Prof. Nakamura. Though he was in another department, I always thought of him as a valued senior colleague. He contributed significantly to the positive atmosphere at the UofL of the 1980s and later. He was wise, perceptive and refined. Safe crossing, Kaz. Blessings to you and your family.